Maeklong railway train market stands out from others for its unique feature: it sits atop train tracks! On a daily basis, the market is transformed to allow the train to pass. The market is really no distance at all from Bangkok, is easy to get to and well worth the trip. 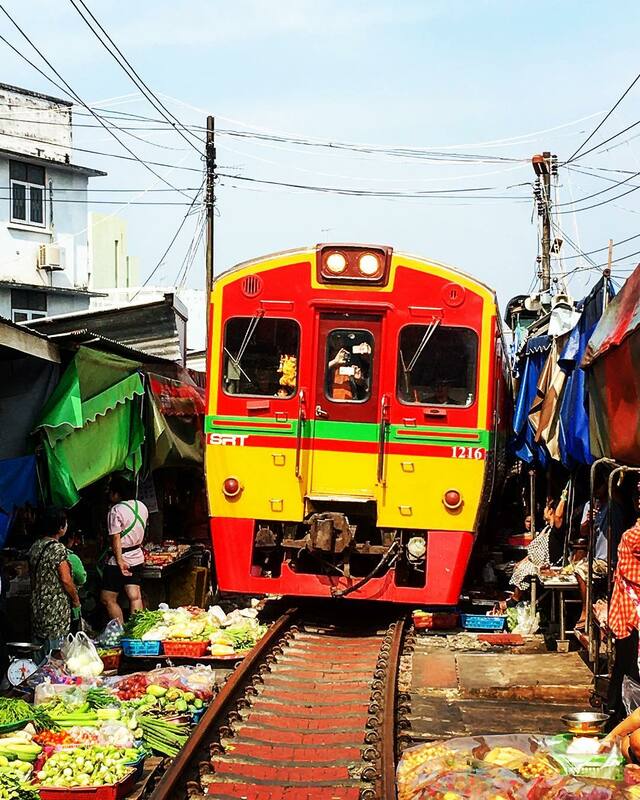 To all Thai travel enthusiast, observing the trains passing through the market is one of top things to do in Bangkok. The train passes through Meaklong market 8 times per day! 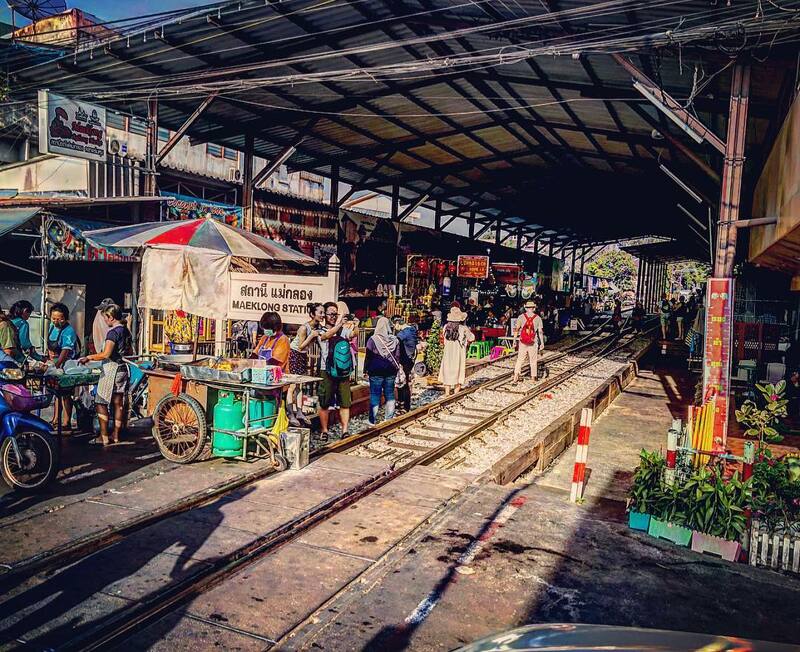 The Maeklong Railway Market has been around since 1905. It’s found in the province of Samut Songkhram, located on the Gulf of Thailand. Fishing is one of the main livelihoods of the people who lived here, and the market was another way in which to sell their goods. Officials decided to build a railway in order to better deliver these goods to provinces around Thailand, including the capital. The market remained, however, despite the new tracks that cut through it. The Maeklong Railway was built in two separate stages. The Tachin Railway Ltd, founded in 1901 constructed a line to Samut Sakhon from Bangkok. It opened in 1904 with eight stations. A year later, The Maeklong Railway Company opened the 34 kilometer Ban Laem Line. The lines merged in 1907 to form the Maeklong Railway Ltd. The company originally opened the railway as a goods line, transporting produce from the fishing ports of Samut Sakhon and Samut Songkram to the Bangkok markets. The Thai military gained control of the railway in 1942, during World War II, and the line was nationalized by the Thai Government in 1946. The line was operated by the State Railway of Thailand from 1952 and was fully merged into the SRT in 1955. In 1961 the line’s original terminus at Khlong San was closed and replaced with a bus stop, to ease traffic congestion in Bangkok. The railway became famous for its route through the Maeklong Railway Market. It is one of the largest fresh seafood markets in Thailand and is centered on the Maeklong Railway’s track. Whenever a train approaches, the awnings and shop fronts are moved back from the rails, to be replaced once the train has passed. 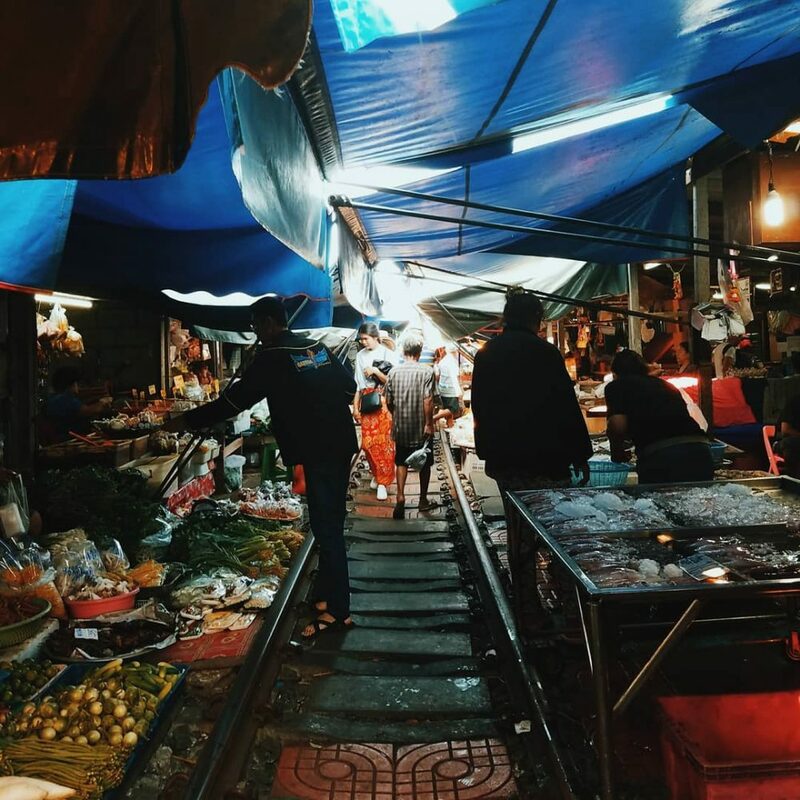 The Maeklong railway market has everything that we’ve come to know and love in Thai markets. Its stalls have displays of fruits, veggies, meats, seafood, as well as sweet snacks, clothing, and flowers. The major difference is that there are train tracks running straight down its middle! The train passes through the market 8 times per day. A little warning bell goes off over the speaker system just a few minutes before the train comes. Within a few minutes of receiving the warning, vendors pull back their specially designed awnings before the train comes, sometimes only moments before. That’s why the market is locally known as the Talat Rom Hoop which translates into “Market Umbrella Close”. The train’s fog horn announces its arrival just before it rounds the bend. Prepare yourself a good camera for recording this unique moment! It’s a pleasure to just walk along the market and see what the vendors have to offer. Or you can ride the train through the market, you will be able to see how the vendors move their things and pull in their awnings seconds before you pass by. Walking along the market in the train is only part of the experience, Riding the train is also a great experience. 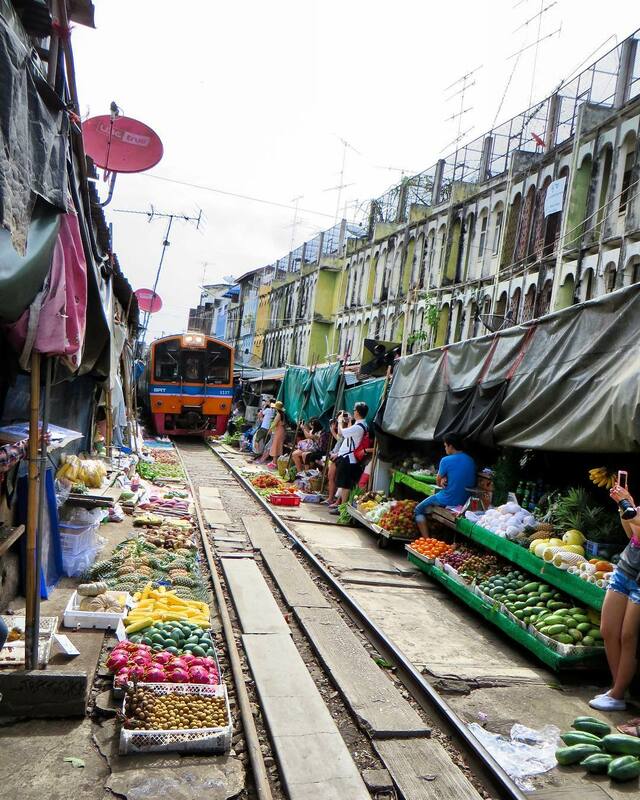 The Maeklong railway market is one of the most favorites among visitors with much to offer a feeling of “real” Thailand. 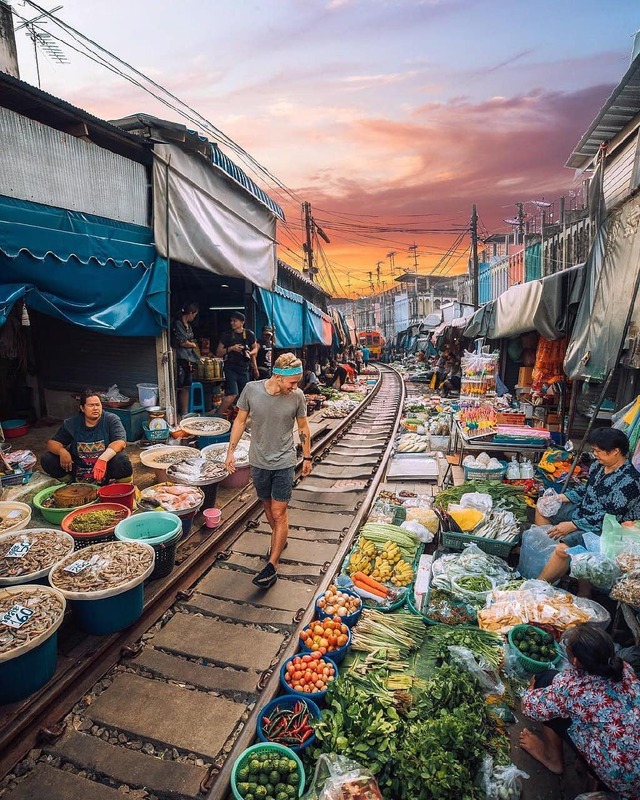 You will find the Maeklong Railway Market about 80 kilometers outside of the city, located in the Samut Songkhram region. Depending on Bangkok’s traffic, it takes just over an hour to get there. There are a few different ways to get to the train market: The first is to take a minivan departs from Bangkok Southern Bus Terminal (Sai Tai Mai) or you can get to the market by train which takes about 3 hours in total. Catch a train from Wongwian Yai Station to Mahachai Station. Cross the river to Tha Chalom Pier. 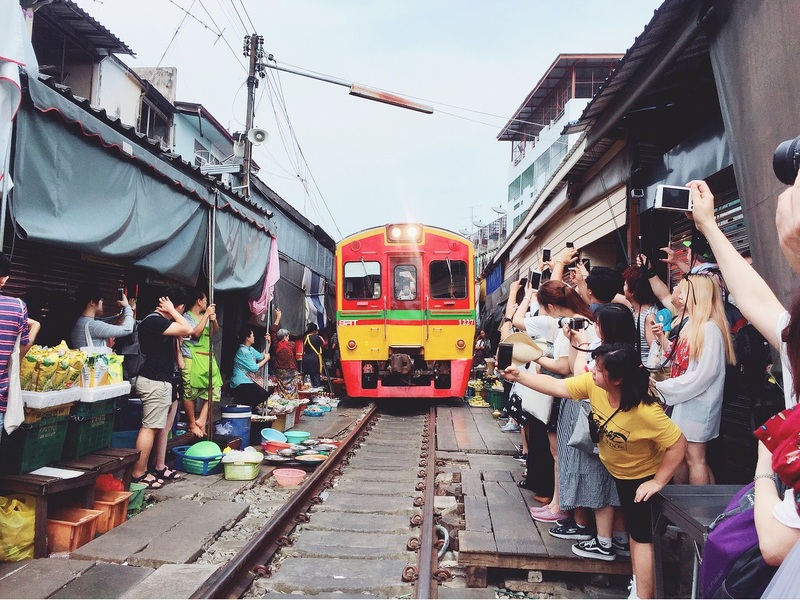 Catch another train from Ban Laem Station to the Maeklong Railway market, looking up the train timetable before heading out so that you do not miss it. However, that train’s times are subject to change, and the trains are often late. One of the main things to do in this market is to watch the train pass through. In the middle of the market, there are train tracks running all the way through the market. People are walking all over these tracks into the last minute. The quality of this market lies in its novelty and the train that passes through … not necessarily its goods. It is here where you will find mainly Thai food for sale. While there will certainly be some clothing and accessories available, the bulk of this market is made up of Thai sweets, meat, seafood, vegetables, fruits, and drinks. It’s surprisingly cheap at Maeklong Railway Market, most of the things available was a lot cheaper than what it is in Bangkok. If there’s anything you’ve seen in Bangkok that you’d like to try out, this is the place. The Train market is open 7 days a week from 6.20am to 5.40pm. The Maeklong Railway Market opening hours follow the first and last train arrivals at Maeklong Station. Go in the morning, then spend your afternoon in one of these great live music bars in Bangkok. It’s a great way to end your day. Alternatively, you can move on to take a short drive to the boat pier and take a trip along the canals. This will lead you to Damnoen Saduak Floating Market. 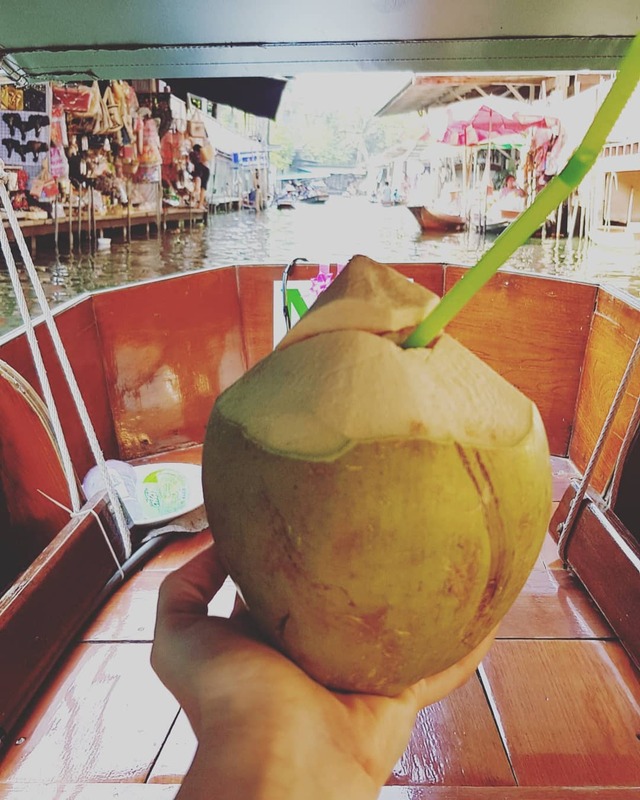 The floating market was once the main market for local vendors and people of Bangkok but has since begun to place a bigger emphasis on its tourist appeal. Explore Bangkok floating markets with Inspitrip now! 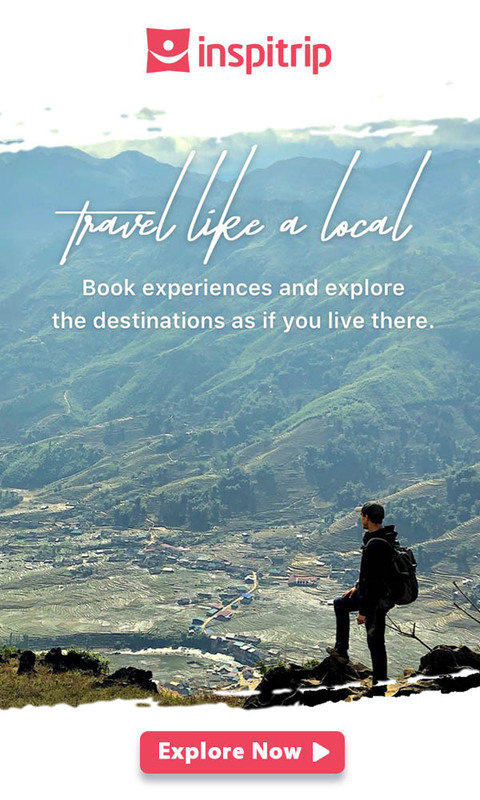 If you get to Maeklong late and decide to stay overnight, there are hotels in Maeklong town. There are are also some lovely accommodation options in Amphawa floating market, which is very close to Maeklong as well, with hostels and hotels right on the water’s edge. This part of Samut Sogkhram is a beautiful water-world of rivers and canals, also having a floating market which sells lots of great foods, and there are some lovely waterside hotels nearby. It is best to visit the market in the early morning. Midday and afternoon are hot and uncomfortable. If your only option is afternoon, it is still possible, just be prepared and bring a fan and some water. It is totally possible to include Meaklong market and other destinations for a one day Bangkok visit. Arrive early. Or at least, give enough time to walk down the tracks before the next train comes. The perk is that farther you walk, the fewer people there are. The main entrance is crowded. Let other visitors exit the market before trying to go in. Although this isn’t a fast-moving train, it’s a no-brainer to stay clear of the tracks when the train is coming. Don’t stand on or lean over the tracks to get “the perfect shot” or you may get perfectly smushed.